1.Peel the skin of garlic cloves and grind it to a paste . Crush whole pepper in a mixer or hand motor coarsely. 2.Sieve Bengal gram flour/ besan, rice flour together. Rub ghee and soda together till frothy on a flat plate. 5.Heat enough oil in a pan then place lemon size portion of dough and press onladle for the batter to fall directly into the oil. so that long pieces of dough falls into the hot oil. Rub continuously by gathering all the excess dough. Note: wipe the ladle with a wet cloth each time. Otherwise the dough may stick to the holes and when it dries, it will be difficult to rub the dough again on the ladle during next time. 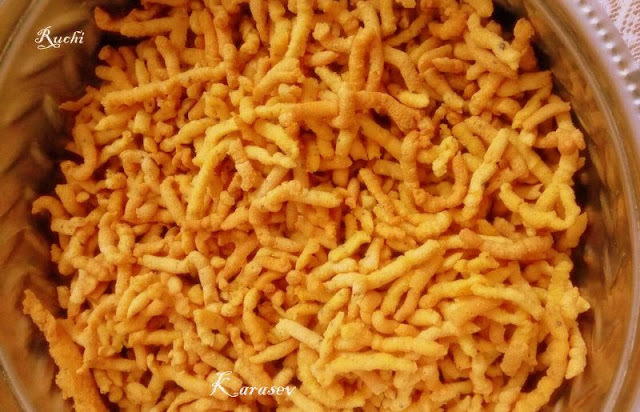 If the dough is too soft, it means there is too much of water, which means, it will absorb more oil and the sev will not be crisp.If the dough is too hard then the sev will be hard too. To make long strands of the sev, press the batter slowly but hard on the ladle and not too fast.